This evening we attended Genesee Center for Arts & Education's spring carnival and arts auction. I bid on several really cool letterpress posters and lost out on all of them. 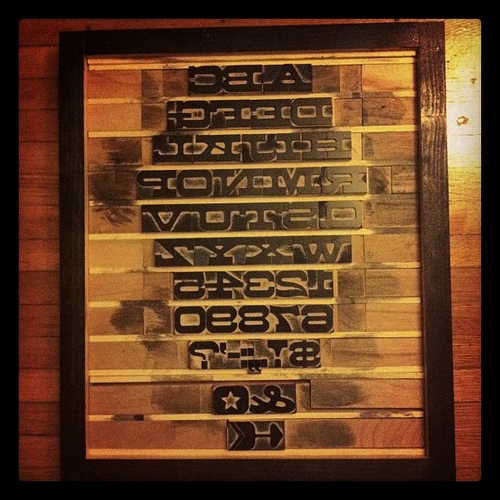 We did however manage to place the winning bid on this Aldine wood type alphabet. We could probably actually use it - I have a gift certificate to a GCAE letterpress workshop... but I also think it looks cool enough just like this to hang on a wall! Score! That's beautiful! I love the patina from the ink. Would look great on the wall! It has a good look on the wall. Check for computer desks for home as well. Cool hanging display you have here, I'm hoping if by any chance you could also help me out in searching for an inverted Snellen chart design wall display. I've been searching for it to several Los Angeles furniture stores now but up until now, I can't still find one. Perhaps the place where you bought this one is selling one.